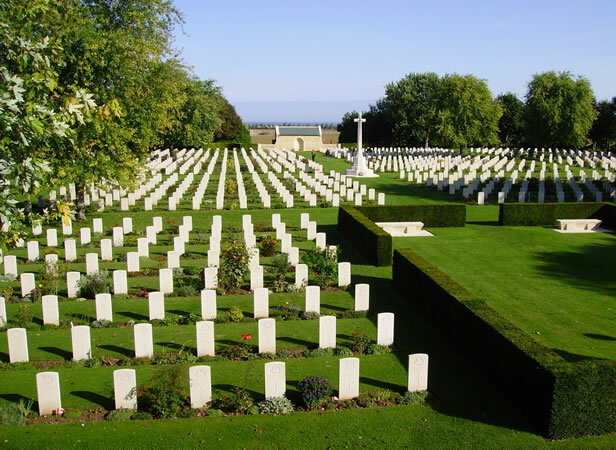 Located between Beny and Reviers, inland from Juno Beach on top of the little hill that overlooks the coast, this cemetery is beautifully maintained by the Commonwealth War Graves Commission. It is the final resting place of 2.043 Canadians (as well as one French and four British soldiers) including the 359 Canadians killed on D-day. The entrance is decorated with four maples and the Stone of Remembrance. At the center of the graveyard is the Cross of Sacrifice, surrounded by the limestone headstones (all of which have recently been replaced).